More from Lei's hometown, this shupu is loose-leaf and cost about the same as the dreaded 2006 Chen Guanghe Tang Yiwu Yecha from Houde . Of course, this makes it fairly expensive by small-town Chinese standards. First up is the veracity of its claim to age. 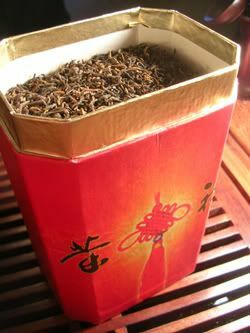 Regular readers might remember the Maguan Panguwang bing that Lei bought in quantity to fulfil her daily shupu drinking. Tea Logic's VL pointed out that the wrapper was reminiscent of the style that became popular in 1999 - recalling that the tea vendor in Lei's hometown claimed he purchased it in 1997. Going solely on the characteristics of the tea, my impression is of something in excess of 7 years (of which we have a fair number of examples). Given also that the vendor is (as I understand) a trustworthy friend of the family, the scales tip in his favour. Perhaps it is unimportant, given the pleasing outcome of the tea (and it's price that asymptotically approaches zero). However, the question becomes somewhat more interesting when we consider this loose-leaf shupu. The same shopkeeper claims that he bought this when he started the shop, which was in 1994. It was an interesting comparison between this tea and the 1997 Maguan Panguwang. Note that the vulgar red box [pictured] is a left-over that a Beijing friend left behind, which turned out to be just the right size. My a priori assumption is that shupu may peak at around 10 years. Tiny tips, exclusively, looking like baby fishing bait. A range of darknesses with some lighter browns. A full shupu aroma. The soup is golden orange, unlike the pure burgundy of the Maguan Panguwang. The aroma is creamy, and crisp - decent shupu. The flavour is where the interest lies, as the smoothness of the Maguan Panguwang is met and exceeded. The overall impression is of smooth pine. It isn't a strong tea, though, and borders on being too gentle. Is this over-aging of a loose-leaf? I am reminded of the 1960s Gaolingongshan maocha, which is rapidly losing its flavour. This is a surprisingly active tea. For those interested in / credible of chaqi, it might be worth trying this one - there is a significant effect felt even from the aroma, which condensates fairly heavily on the back of the tongue. "The tips of my fingers are pulsating and tingling strongly." The soup fades to a mid-orange after five infusions, clearly lacking the pace to continue. We had considered getting the little that the shopkeeper has remaining of this tea, but given that it will take some time to consume what we have, the reduction in strength yet further would not be worthwhile. Compared to the Maguan Panguwang, allegedly 3 years younger, it is yet finer, smoother, and more rarified - but it has turned a corner. The chaqi is full and flushing, but (perhaps fortunately) it doesn't perform as well as the tea that Lei bought in quantity. I should credit her with good judgement at this point, of course. Is it 1994? It's certainly older than the Maguan Panguwang, which feels older than 5-7 years. I'll leave that question on the shelf for a rainy day. Thanks to Mike for this sample, which is a Houde purchase, where a bing sells for $35. 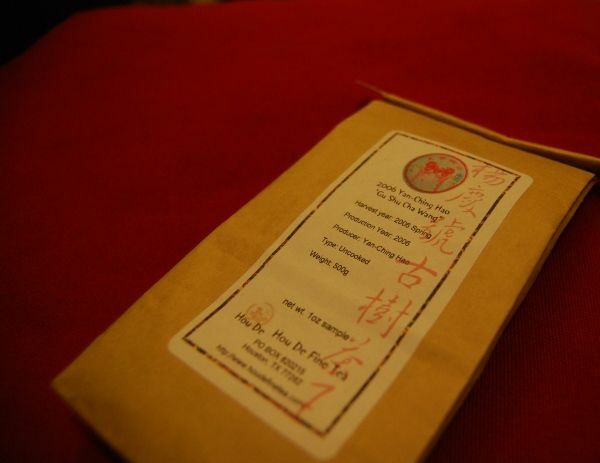 The web-site describes this as a "gift" tea, produced by the Changtai Tea Factory in 2004 "to prepare the upgrading to Changtai Tea Manufacturing Group in 2005" - the meaning of which can be read in several different ways. 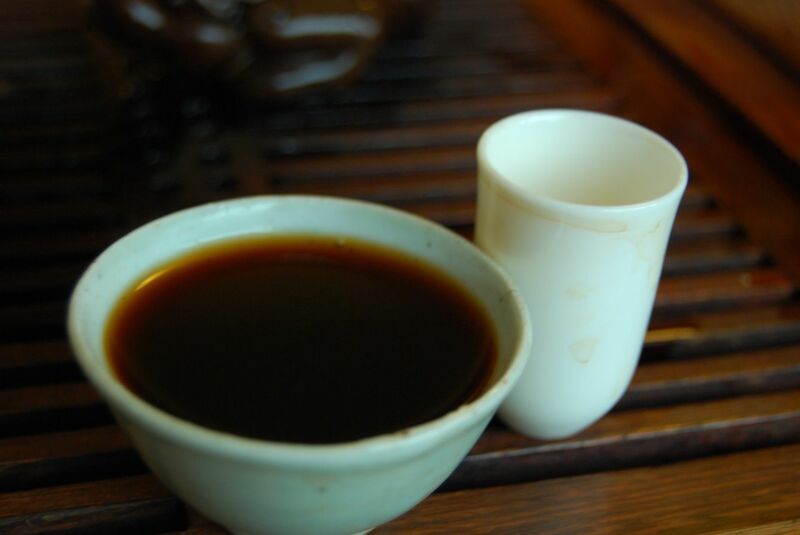 The Houde description quotes the neifei as indicating that it is a blend of old-plantation, big-leaf Yiwu with maocha from other areas. Attractively chunky leaves, in an apparently two-headed mixture of dark leaves and green leaves - perhaps evidence of the blend to which the neifei refers. Delicious pine-wood, mushroom-like scents that are very nearly, but not quite, fishy. It's good to be home, seated on my little red cushion, behind the tea-tray, watching the tree-tops blowing in the distance. 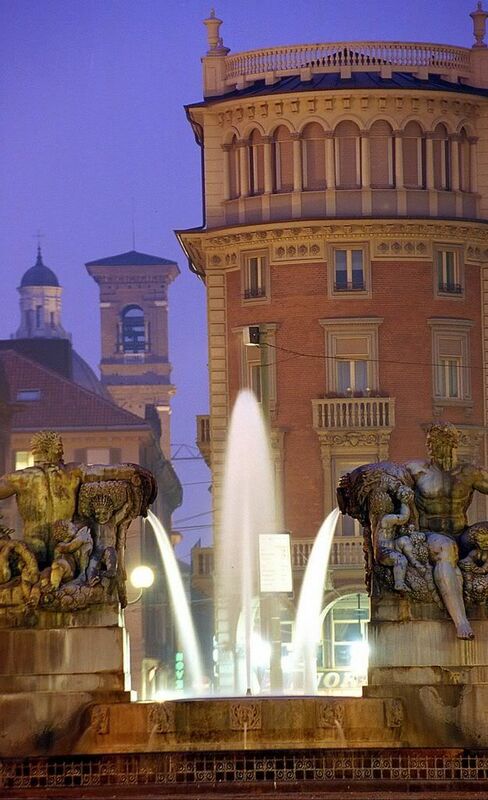 The colour of the blue sky, the green bushes, and the pink flowers visible from the window look almost unreal in their vividness, compared to the dust-and-stone of Baroque Turin. A good orange-yellow colour, which is pretty and clean, gives an immediately positive first impression. The first sips from the first infusion are very good: rich, bass flavours are almost salty, making my mouth salivate. The travelling time to the throat is long, and the progression of gentle fern-like scents in the wenxiangbei are similarly unhurried. This appears to be a tea to drink slowly; it would be a mistake to overlap the mouthfuls, or to not give the wenxiangbei at least 30s of attention. The flavours are rich: fern and pine, so very plant-like. The stimulation of the salt-sensitive taste-buds is an interesting sensation, which I have previously described in other teas as "food-like". These initial infusions appeal to my personal tastes. Later infusions lose complexity, and the fern-and-salt interest fades into a different set of flavours: the simple tastes of dried fruits (apricot, mango) that remind me of the 2002 CNNP sample, kindly sent out by MarshalN last month. Throughout the tea from beginning to end is a potent ku, which is really only evident at the back of the throat - a good place for it - where it provokes a mouthwatering huigan after the long progression to the throat is completed. Again, don't rush this tea. All is revealed. There are three major components to this tea [pictured]. Some leaves, as noted from the dry sample, are hard and black. I suspect these give the low fern-and-salt interest that I experienced in the first infusions. The toughness of the leaves means that their contribution would not last too many infusions, and the bass, low range of flavours could easily be ascribed to these dark specimens. Some leaves are green and strong. The continuous ku is probably derived from these youthful examples. Some leaves are more tippy, and show the considerable redness of oxidation. Just like the 2002 CNNP [revised notes to follow], these give the tea that latter shallow fruitiness. Houde describes later infusions as "floral", and I suspect we're describing the same phenomenon. 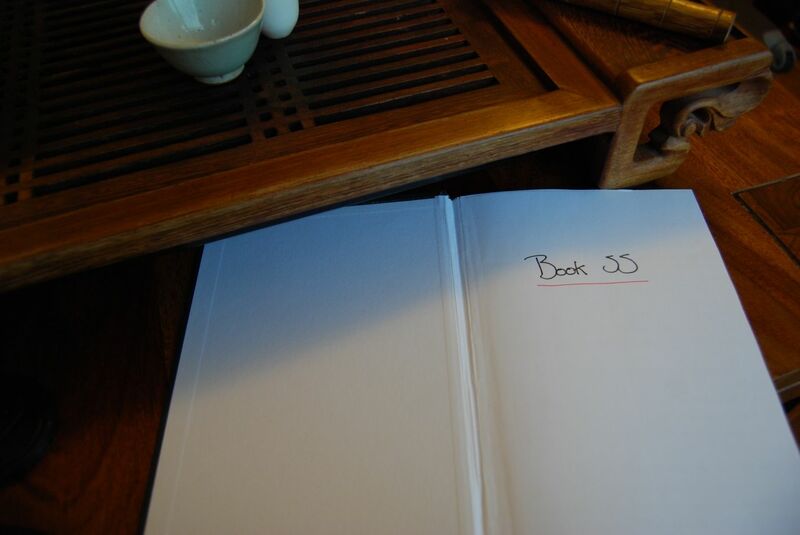 Lovely to begin, becoming merely pleasant later on. The presence of the red-oxidation is cause for concern with its long-term storage prospects. Houde notes that "the flavour should improve after 3-5 years of storage", but the presence of the under-processed (kill-green stage) leaves causes me to respectfully disagree. The opening infusions were very enjoyable, and I was nearly sold on this tea straight out. It is fortunate that I kept on to the latter infusions, which has caused me to revise my opinion, for which I cannot recommend buying this tea for the long-term. Scouring the Chinese shops in the Turin Chinatown, scraping by on my very poor Mandarin (in preference to my yet worse Italian), I found a pile of boxed tuocha selling for virtually nothing ($4 each). Just for fun, I thought I'd grab one and see if it's worth buying one or two more. After buying the tea, I headed to the conference social event, which took place in the vaulted underground space underneath one of the city landmarks. Happily, there was a long, chrome bar running its full length. As if thrown back to the world of Austin Powers, all of the tables were illuminated from the inside, as were the chairs - and the colours slowly cycled. Sadly, my entirely inadequate Mandarin skills prevented me from finding out which year this tuocha was produced, but it's most likely to be a 2006. I since found an Italian boutique tea-shop selling something similar, for a little more money, which was all 2006. It costs nearly nothing, at $4/box, and so my expectations are limited! 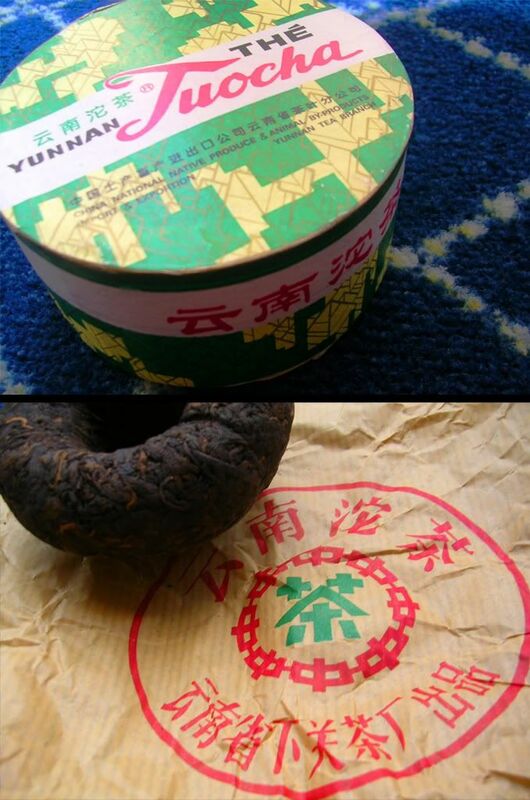 The box is CNNP, and the wrapper is labelled "Yunnan Province Xiaguan" - let's see what they've managed. Short and dark, and scented like every other average shupu in the world - of which there are many. Odd-looking infusion times, no? They reflect my efforts to try and get something amusing out of this tea. It starts off generic enough, with a sweet aroma. The soup is surprisingly clean, and a good orange-red. There is a truly extraordinary mintiness to the flavour. Other flavours are almost absent, save a background-hum of standard shupu. Doubling the infusion time from 6s to 12s, and the tea is still light, fresh, and thoroughly minty. There is absolutely no bitterness, nor huigan. I step it up to 30s, and then triple it to 90s - pretty dangerous for a fourth infusion! Still, after such immense overbrewing, the tea remains muted, mediocre, and minty. Tippy and small with a few whole leaves, the grade is fairly decent. I wonder if Xiaguan are still boxing up "export-grade" leaves in this way. Some leaves stand out as being quite green, reminding me of a shengpu/shupu blend that VL showed to me recently. It costs nearly nothing and is worth every penny. Again, this backs up my prejudice against modern-day CNNP. I'd be surprised if this were truly Xiaguan Factory, unless they've got into the habit of producing ultra-mediocre quality produce for foreign export. The ability of this tea to remain unchanged and generic despite massive overbrewing is as startling as its mintiness. This week, Italy. 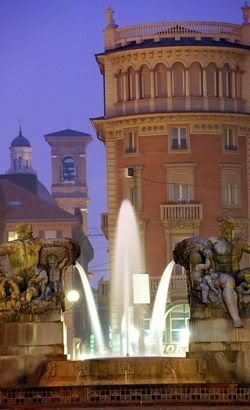 Turin, to be precise - home to the Shroud of Turin (alleged to have wrapped Christ's dead body), The Italian Job (seminal 1960s English film), and me - for the next five days. So, let's break out the conference survival kit once more. Travelling Europe is getting deceptively easy - the new regulations mean that getting from England to Italy is just a matter of quickly showing someone a passport as you walk past. This has its down-sides: it's not until I'm sitting in the back of a taxi trying to communicate with someone that speaks no English that I realise... I really am in another country. At times like this, I also realise that the only Italian I know comes from the libretti of opera. This is handy if you need to swear your undying resolve to avenge your wronged father for the capture of his kingdom, but not so useful if you need to direct a taxi driver to a hotel in the city centre. Like many others, I've been enjoying the recent tales of Californian tea consumption, and particularly admiring the wushu-style gongfu moves of certain members of the West-Coast tea community. Though probably with less Shaolin-inspired pouring (though I'm always happy to be proved wrong) and almost definitely with less 1950s pu'er (though I'd be really happy to be proved wrong in this regard! ), we're putting on an informal, bijou meeting here today. Xiaomao, Tea Logic's VL, Iwii, and myself will be raising the pinmingbei in your honour - assuming that they can successfully navigate the medieval labyrinth which is Oxford. Prior to all that, I've been enjoying some dancong kindly provided by CB (thanks! ), which was bought from Royal Tea Garden. Listed on their web-site, it's the "second grade" variety. 4-5cm dark, twisted strips. Generally dark, with oxidation varying down to some clear greens. The strong, familiar dancong aroma of peaches. Yellow-green soup which looks rather Chablis - quite thin in colour. The wenxiangbei holds a very pleasant combination of two familiar scents that aren't usually present in the same cup: the peach beidixiang of conventional dancong, then the butter lengxiang of gaoshan tieguanyin. The flavour, also, is an interesting hybrid: peach to open, then low (almost Wuyi yancha) roasted fruits. 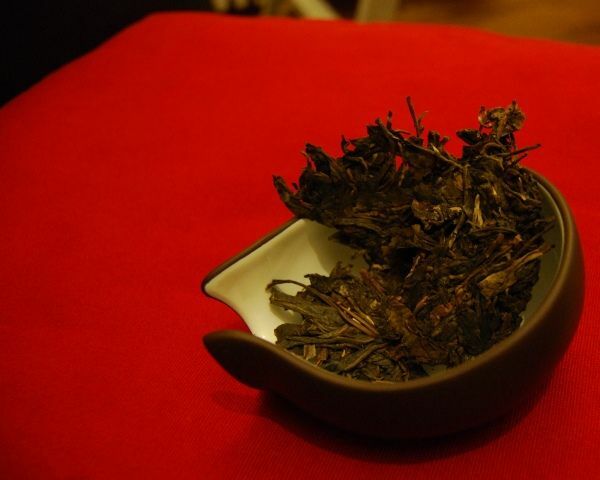 The process of roasting has been performed quite skillfully, as it is integrated well into the straight oxidation of this fairly spicy, buttery wulong leaf. The adjoinment is a touch clumsy, the gaps are evident, but it's very enjoyable. As the infusions march on, the gaps get a little wider as the strain starts to show, with the various components going their separate ways. By the fifth infusion, we are down to the generic sourness of "tea". Large and healthy - very green on the inside of each leaf, accounting for the buttery leaf-aroma and -taste. Good fun for the first two or three infusions. This is a decidedly inexpensive tea, and should be treated as such - in that regard, it performs very well in its class. A touch mundane as the infusions wear on, but it has already outperformed its grade. A fun little daily tea. The Shuangjiang Menkgu factory is of course famous for its "Mengku Rongshi" [Mengku Rong-family] brand of shengpu. Today's "Yuanyexiang" [wild grass-field scent] is a special order from Chen Guoyi, the gentleman allegedly responsible for popularising gancang [dry storehouse], and claims to originate from old wild-style plantations. Perhaps ironically give Mr. Chen's history, this "thick paper" version has seen only shicang [wet storehouse]. It was sold by Houde, and this sample came to me courtesy of the generosity of Dr. Mike Sichangpu (ne Psychopuncture) - thanks again! Surprisingly dark - shicang really does do the trick as far as giving the appearance of accelerated aging. A mixture of grades, from stems to tips, though no leaves of any obviously great size - it looks fragmented. 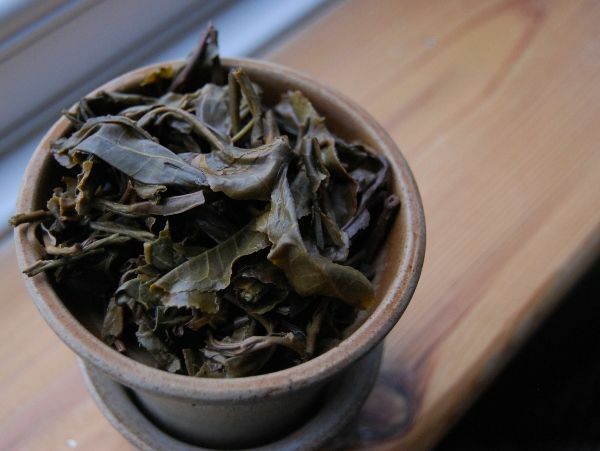 The familiar, slightly clammy and earthy-sweet aroma of shicang is all about the leaves. What a trooper this tea turned out to be, weighing in at 12 infusions whilst still carrying a good flavour (albeit 8cl brews). It's a simple tea. What there is present is very enjoyable - if shicang fits your personal taste. Xiaomao dislikes the whole damp feel of it, and limited her participation to a single cup, this time. 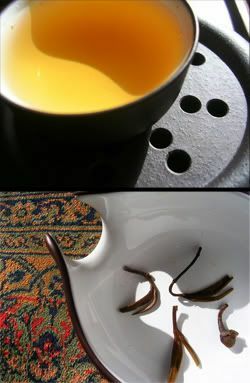 Oddly enough, the first few infusions are rich in colour, as shown in the photograph, though this rapidly dissipates to a lighter orange-red even by the third infusion. It is as if there is something short-lived and rapidly-infused in this tea that provides great opening colour and aroma, which quickly vanishes. What is left is pleasant (and soldiers on consistently for the remaining brews), but it's quite a change. Also, those initial few infusions have a smoothness and slickness that one associates with tips. Looking at the dry leaves, while tips are present, they're fairly limited, and this corresponds closely with the limited number of smooth infusions given. The overall feel is the familiar damp-library flavour and aroma of shicang, with a background of great sweetness. There is penetrating ku, which really develops in the fourth infusion, and then remains until the end. Particularly once the tea has got into its swing, around the fourth infusion, it is very "traditional Chinese medicine": slightly minty, and very cooling in effect - so much so, in fact, that I needed to put on a jumper. This potency of effect is backed up by a considerable caffeine content (not really chaqi). The medicinal character wanes by the eighth infusion or so, but I'm impressed it got out that far. At the end of the session, the fundamental characteristics of shicang and ku dominate, with a generically sweet background. Chopped and bitty, it is not easy to find large leaves. There are some oddly circular examples present [pictured]. An interesting opening of tips and burgundy, which matures into a fully-fledged medicinal effect. I would like to dry-store this tea for five years or so, to further develop the richness of the background flavours, reduce the ku, and hopefully shift the balance away from the quite dominant shicang effect. Its endurance bodes well for its long-term prospects. "Behold! Upon my bending spear! A monster's head stands bleeding!" 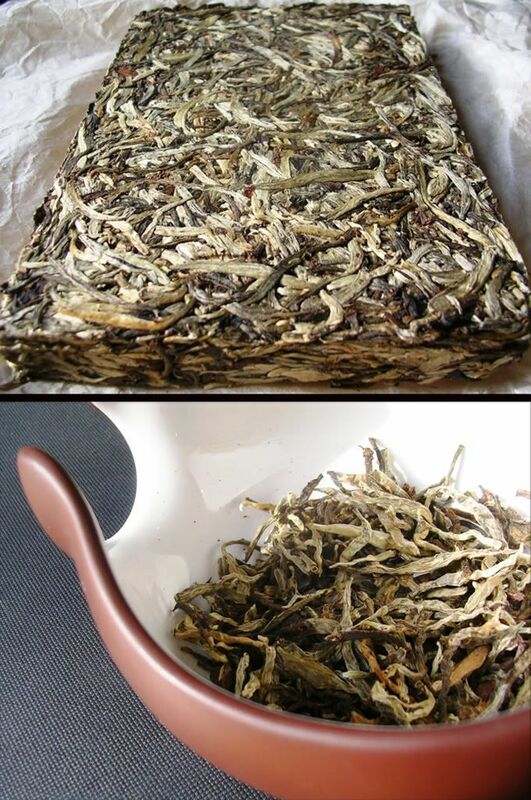 After an epic struggle, Xiaomao defeated a Maliandao tea-merchant in one-on-one combat to win this tea's freedom, a yinzhen zhuancha [silver-needle brick-tea]. It is of unknown manufacture, and cost approximately as much as an entire tong of yesterday's ten-year-old Maguan Panguwang - is it worthy? Whole silver-tips, as one would expect, with one or two darker stems. A low mushroom aroma hangs about the brick - very enjoyable. The soup is a light green-yellow, the colour of Chardonnay. A direct, sweet beidixiang ends in a long, sour lengxiang. It's pu'er, but lighter and sweeter than usual. The flavour is fascinating - I don't drink much yinzhen pu'er. It is to shengpu what beicha is to lucha, in terms of aroma and flavour. There is a hint of the almost "barbecue" richness (with no smokiness) that I usually associate with biluochun. Smooth texture abound, courtesy of its tippiness, with very little in the way of huigan. It is entirely devoid of all ku [good bitterness], despite my attempts to push it to see if any is available. 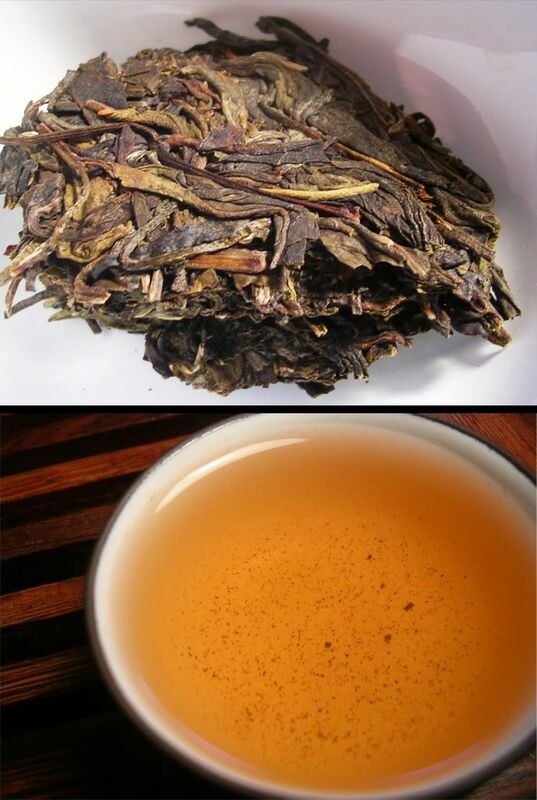 The range of flavours is wide, as befits good leaf, but not deep, as one might anticipate from tip-tea. Almost entirely tip-with-single-bud, this cake is made from a particularly high grade. A tea-fruit rattles around in the chahe, indicating its season. Simple, fine, but ultimately unmoving. It is recognisably pu'er, but taken as far into "drink it now" territory as is possible. It makes a fine refresher, but is not one to satisfy those deep-seated shengpu desires. The base of flavours could bode well for aging, but the absolute lack of ku makes me wonder if this will simply fade through time, rather than becoming more mature. I'm not convinced that the young shengpu pot is the best choice for this tea. It could be that the few years this tea has seen are as good as this tea is going to get - let's see how it ages. To Earth and Heav'n I will complain!" This is a shupu review: you have been warned. Forming a part of Xiaomao's recent purchases from her hometown, this is a collection of just over five tongs (shupu being Xiaomao's daily drink), most of which have been left back in the Chinese house. Like the Guangnan Fenghui shengpu, she has been singing this one's praises while in China, and I'm trying my best to catch up. Again, "Maguan" is the region and "Panguwang" is the name of the factory, which is named after the Ancient who separated Heaven from Earth in the old Chinese creation myths. "Laojunshan" [old-man mountain] is the name of the bing. I notice that their pinyin isn't quite correct... then again, it seems that only Westerners and Chinese below the age of five years care too much about pinyin. Tiny and tippy, the cake is as dark as one would expect. There isn't much of an aroma, rather unusually. I tend to look for some dark fruits and whatnot in my shupu, but at least it isn't unpleasant. The lack of a dry aroma is immediately dispelled by the wenxiangbei, which opens with a smooth scent that reminds me of creamed corn. There is almost no lengxiang, though. The soup is a rich burgundy, and is very crisp in its presentation and delivery. This is clearly shupu, being of the sandalwood and raisin variety, but is very smooth, and quite malty. Henan Province's naturally dry storage has been kind to this cake, which (theoretically, at least) has reached the shupu peak of ten years. I am of the firm opinion that older shupu, if the grade and manufacture are decent, can be very satisfying. The feeling in the mouth is of a light oil so viscous that it is almost a jelly-like sensation (which, while sounding odd, is a smooth and pleasant affair). The tips have been very kind to the texture of this tea. My lips buzz with chaqi; like most good shupu, the feeling is one of calm and comfort, which makes it a fine choice for an evening session. 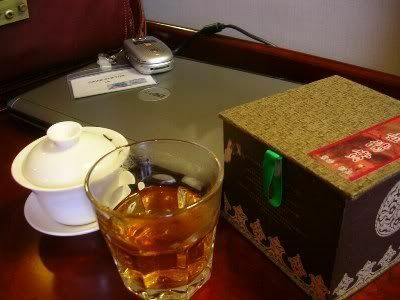 Later infusions open up in the wenxiangbei to become more warm and woody. The flavour reminds me of the low, heavy wooden beams in the Tudor kitchen of my grandparents' farmhouse. Dark little tips - fairly inscrutable. Courtesy of its excessive tippiness, it seems almost impossible to overbrew this tea (which I tried). There is no real huigan per se, more a gentle mouth-watering finish to the woodiness that is smooth and enjoyable. It is fairly simple, as is the lot of all shupu, but it works well. It's a smooth, time-worn Buddha made out of sandalwood - not exquisitely refined, but the kind of practical beauty that such things acquire through careful processing of a basic product, and good conditioning over the years. Each time that my wife's family comes to visit, they bring with them some of the (rather large!) stores of pu'ercha that we have aging in central China. There, the weather is baking baking baking, and, due to the proximity of one of the country's largest rivers, it is also humid. This is a good place for tea, I think. Where flora grows abundant, due to temperature and humidity, so too flourishes pu'ercha. This charming old shupu was most inexpensive when we bought it. The shopkeeper had kept it since setting up his shop in the late 90s, he claims, and hence places its age around 1997. The wrapper is distinctly dated in its design; it cannot be older than the later 90s. However, the age of this tea is apparent even from its appearance. It is certainly older than 10 years old, and 15 years feels approximately correct, give or take a year or two. The aroma and character are immensely smooth, like an old stone. It is easy enough to find old, bad tea, and hard to find old, good tea. These shupu cakes, while inexpensive, must have been very strong when young, because they still pack something of a punch. The heavy soup, pictured above, brews thick from the first infusion, and has a great deal within it. The vanilla warmth of rounded shupu is very pleasant, and I am quite happy to be able to drink this as a frequent, low-maintenance, high-reward tea. Straying a little from the beaten track for today's notes, many thanks to CB for this sample of heicha from Jing Teashop. It looks as if this tea is no longer in stock, and so information is limited. As a liuan, it is fermented in the "wodui" [moisten pile] manner used in the processing of shupu, using the same leaves as the famous lucha, Liuan Guapian [Liuan Melon-slice], originating from Liuan in Anhui Province. 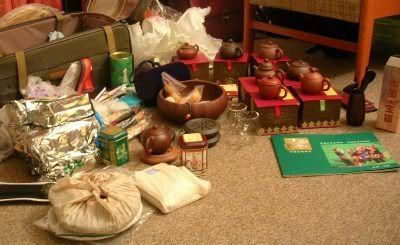 Generally, these teas are quite inexpensive, at around $20-$30 for 500g of a 5-7 year-old vintage. I suspect that many heicha have not seen the price increases that other genres have, simply because of their relatively low popularity. Raised on fairly hefty Indian and African teas, I rather enjoy heicha - in the morning. Don't drink them at night! Dark and tippy, with a few less-fermented chocolate browns. A quiet, raisin-like aroma. This is a strong tea - in the purely caffeinated sense. It sits in the forebrain like a strong coffee, hence the short number of infusions. We had enjoyed several tea sessions already, and so reached our finishing points long before the leaves did. The aroma is "distinctive, original, individual" [quoted material courtesy of the return of Xiaomao, as before]. The soup looks very much like yancha, and this continues into the aroma where a similar roast can be detected. However, it differs in its dark, fruity beidixiang, with a long, malty finishing aroma. It is tangy and "powdery" in the flavour, and is very clean and crisp in all regards: the soup has good clarity, the flavour is in and out like a surgeon. A megaton explosion occurs in my mind as the tea delivers its payload, causing me to blink and perspire. I rather enjoy this tea, but Xiaomao was finished after the first infusion. It's definitely one to greet the day, not a good night-cap. It has the raisin-like flavour of some hongcha. Chopped tips, which appear surprisingly green in the chahe. I was assuming that they would be dark like a shupu, but the green correlates with the availability of fruit-like notes in the flavour. Interesting and powerful. While not complex in any way, it is crisp and pleasant. It is a decent tea, and has been processed quite well, born out in its crisp presentation. The six years of its maturity have been kind to it, giving it a suitably smooth character. Let's get started on the new cakes, beginning with the shengpu. 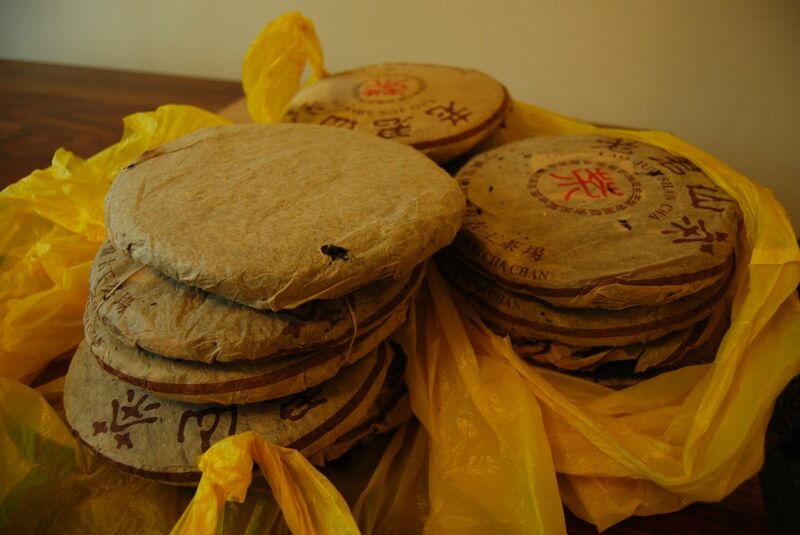 Xiaomao's hometown is in the middle of lucha country (Xinyang Maojian territory), resulting in the local tea merchant having a surplus of pu'er that he can't shift. Xiaomao has been enjoying some of these while away - I've been looking forward to seeing what they're like first-hand. Indicative of his non-existent market for pu'er, the merchant only kept 30 cakes in total, of which Xiaomao took most after a few tasting sessions. They were priced just above the factory price: he paid 25 yuan (~$3) per cake from the factory in 2005, and with transportation, isn't making much profit on the 40 yuan (~$5) at which he sold to Xiaomao. Guangnan is the county name in Yunnan, while Fenghui is the factory. The bing, as you can see, is very Muslim in appearance: green crescents, Arabic script, an icon of a mosque - perhaps all indicative of the Muslim Hui minority. The characters in the crescent are "Yiyi", while the brand is "Yilanxiang", over the top. In small hand-written script on the right of the crescent is "yacha" [tip-tea], presumably placed by the merchant. The cake has a fresh, almost minty feeling reminiscent of some Xiaguan tuocha. It's a thin, thin cake (while still being the usual 357g weight), and yet the compression is not too tight. Insertion of the pu'erdao around the edge in several spots, with some lateral lifting, and it comes apart quite easily - and is easily separable into individual leaves thereafter. Very tippy, all the way through the bing, living up to "yacha". Some darkness, but generally quite light. A sweet aroma, good and clean, with no smokiness. The wenxiangbei is interesting: it opens with a fruity, almost maofeng aroma, then becoming super-sweet, like candy. The lengxiang is enduring, which is a good sign. The freshness of the aroma continues into the flavour, which covers the lips in a clean oil. It has a good strength, which would overpower if the infusions were longer than 3-5s. Evidence of a decent breadth of flavour is apparent, swelling and becoming more prominent like a wave as we approach the fourth infusion. The colour similarly deepens into a solid yellow-orange in conjunction with the flavour. The chaqi causes flushing in my throat and prickles on the back of my scalp. The flavour settles into a more normal straw-like character near the sixth infusion. A mouth-watering but uncomplex huigan shows fair patience. Yecha indeed, and it's interesting that the flavour can come from something so green. Judged on its own merits, independent of price, it's a decent tea, with the good strength and fair depth of flavour that make it appealing for aging. Combined with the price, however, and the scales tilt further in favour of it - it's a decent tea at a very old-fashioned price. It'll be interesting to see what happens to this tea over time - most of it is back at the family home in China, but we have some back in England for comparison. It's definitely going to be worth hitting some more of the tea merchants around the Xinyang area when we're next back, if this trend continues outside Xiaomao's home-town. I find myself wondering if rural, lucha- or hongcha-drinking locations across the country have similar untapped reserves of decent, inexpensive tea. It might be worth spending a week or two to find out. As ever, it's good to be back at home. They say that "travel broadens the mind", but I'm convinced that it just makes you overweight, and causes you to long for a proper breakfast. Many thanks to Carla, Dustin, and the-artist-previously-known-as-Psychopuncture for the teas! Starred pots are Xiaomao's new acquisitions. (1) and (5) are going to be retired to "non-gongfucha status": the former is too large, at 35cl (yet is very pretty, being a wedding gift), while the latter is simply too unpleasant to look at or use. I was struck by the fact that, for the price of the "factory pots" available from Internet vendors, Xiaomao found beautiful, high-quality artisan pots that positively stand out from the crowd. I sincerely recommend a holiday to China, if only to find some decent teaware at 10-20% of Internet prices. What was particularly striking was that a $30 "Internet-pot" can be purchased for as little as $2 - and that's retail, and from the relatively-expensive city of Beijing. It's an interesting business model. Notes on teas to follow. Stay tuned for samples, if they turn out to be decent! I've been trying various combinations of samples, with limited success. A milanxiang [honey orchid scent] dancong did not mix well with a more tangy tieguanyin. So far, the best by far was the sezhong + nongxiang tieguanyin, which my colleague and I thought deserved a name: we have called it the "Crusty Juggler" (following Hot Fuzz - a great movie, which is required viewing). The third of five days in the conference, and my gaiwan is working overtime prior to breakfast. When leaving home, I grabbed lots of sample bags that are running low, hoping to use a few up while away. This morning, I combined ~3g of Yunnan Sourcing's Sezhong [colourful kind] with ~3g of Teamasters' nongxiang tieguanyin, neither being enough for a brew on their own. The result... was surprisingly decent. They are both teas from the same region, but the fruitiness of the sezhong was a surprising complement to the roast of the tieguanyin. Not bad at all. I also revisited "Sample 1" from MashalN, using much shorter infusions than my initial session last time (notes to follow at some point) and found it rather enjoyable - along the lines of the 2 cakes he picked up in Shanghai. For today's tea review, I quote another sample brewed just before I left home. 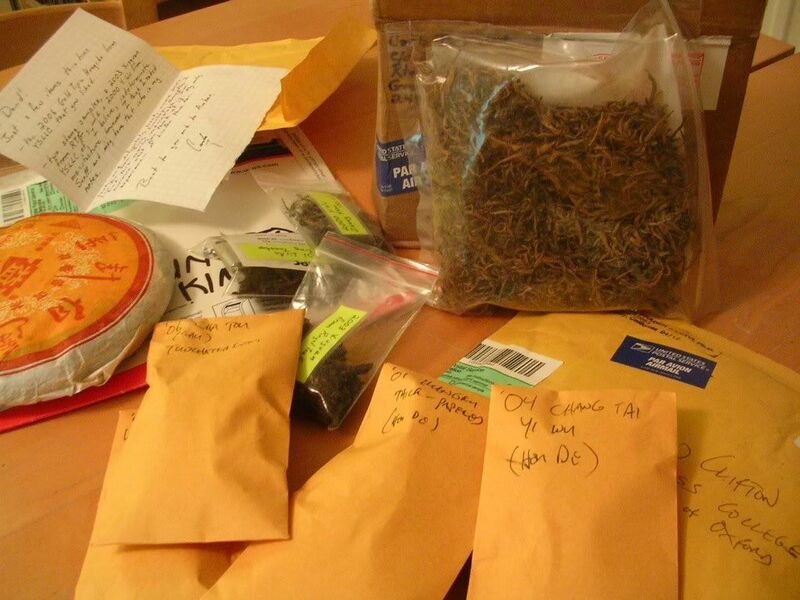 This is a boxed tuocha sample, from Houde. Immediately, we think "high compression" and "tightly-boxed environment", both of which are hinderances to aging. Thankfully, the compression isn't at all tight, being rather unrepresentative of the usual Xiaguan concrete-like tuocha. It is a jiaji [first grade] tea - the "CIB" is China's "Commodity Inspection Bureaux", indicating its higher grade due to its foreign export status. Clearly a good grade: the leaves are small. There is a certain darkness about them, indicating that at least some aging has occurred over the past two decades. A sweet, high aroma pays testament to its constant dry storage. Unfortunately, my 10g sample is at least 50% fragmented leaves, which opens to the door to potential astringency - I try to brew short to avoid this. A clean yellow-orange soup with plenty of tip-fur: jiaji indeed. 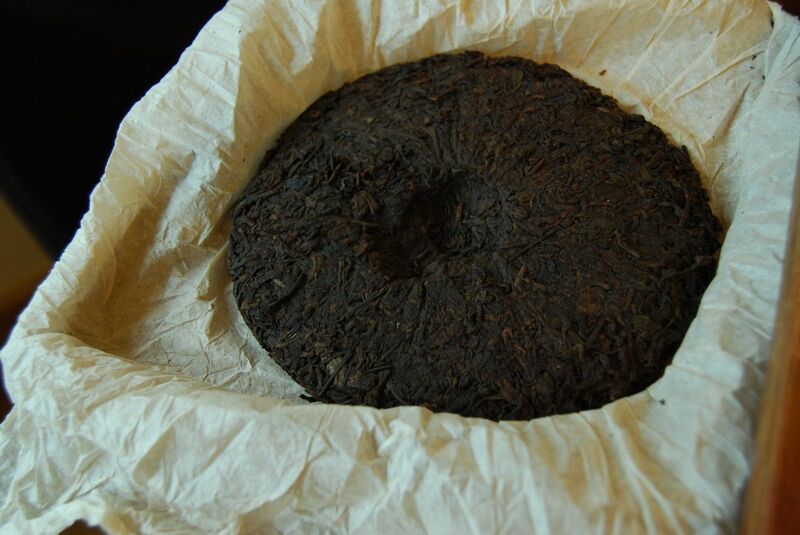 The aroma is, happily, "old": it opens sweet and deep, and has a long, leathery, sweet lengxiang. It is the exact aroma of the ancient old wooden-boxed croquet set that I used to play with as a child, which was my mother's childhood toy before that. The flavour, sadly, is not quite up to the promises of the aroma. The fragmented leaves make the ku rather punishing, and it is particularly strong in relation to the limited pleasures of the quiet flavour. What is available is long and sweet, ending in the leatheriness that remains in the throat and nose. This is a "fine" tea, it is clearly of a high quality, as evinced by its slippery texture and general air of age, but has not the strength of flavour that one would look for in a good tea. It is, like many Xiaguan tuocha, under-matured for its age - presumably due to the box, in this case. Generally small grades, yet almost entirely fragmented. The majority are surprisingly green. Sharp ku rides over a fine, but ultimately uninteresting flavour. Warming chaqi. I won't comment on the price:quality ratio, as I'm probably beginning to sound repetitive in that regard. This cake is a good lesson in selecting cakes for aging: good, robust, deep flavours should be present in a tea when young, because if they are lacking (as in this tea), the result will be rather unfulfilling. 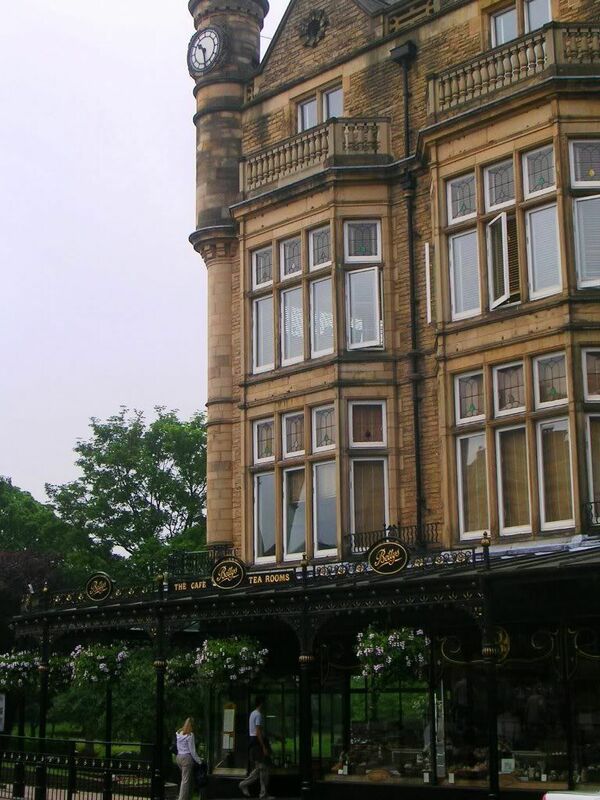 The conference starts at lunch time, which gives me time to look around the pretty town of Harrogate. At this point, I am reminded of the fact that the famous tea company "Taylors of Harrogate" is based in, erm, Harrogate. A brief Internet search later, and I'm in their main tea-room [pictured]. The service is fair, the surroundings are attempting refinery, and the tea-menu is about twice as long as most other tea-shops, but it's still... a bit English. Fair enough, looking around at the clientele, which are either students, tourists or the elderly. I am served by a pleasant lady with an Eastern European accent. I ask what the real name of the "Good Luck Green Tea" is, which she tries to find out but fails. She assures me it is a black tea. I ask if they have any "oolong" (tearooms tend to use the non-pinyin name, of course), and she points me to a Ceylon. I end up with a "Yuluo" white tea, and the "Good Luck" green, both of which are fairly fine grades, but rather unimpressive. Most people are here for the cakes. Let me give you a review from my archive - a baozhong that I rather enjoyed before I left. From Houde, this is supposedly from the qingxin [green-heart] varietal of wulong, which possibly isn't saying too much for an early 80s tea as the non-qingxin hybrid varietals (cuiyu, sijichun, etc.) were not in widespread cultivation at that time. Short, dark twists not more than 1.5cm in length. The aroma is very quiet, being a gentle roast scent when the nose if right up against the leaves. Adding the leaves to the rinsed pot discovers the deep, pungent scent of rich sultanas. Delightful. These leaves come from Houston, and so I feel no shame in writing, "Houston, we have a problem." The soup is a rich orange. I have, most definitely, picked the wrong teapot. Given how many re-roastings this will have had over the decades, I was perhaps rather daft. O, heavenly aroma! My cold body shivers as I inhale from the wenxiangbei. A wonderful spicy-butter beidixiang hands over to a particularly enduring sugary lengxiang. A real treat. The flavour is malted, dominated by the roast, but not such that it becomes aggressive. I am reminded of an old master painting (perhaps the brilliance of the blue dress in Hughes' April Love), in which the amazingly deep colour is the result of many, many layers of light addition. The multiple roasts over the years have given this a smooth, unragged roasted flavour, under which there is a little generic "tea" sourness. The patience is excellent; this tea is clearly in no hurry. It isn't a thick tea, but there is a gentle huigan. The actual flavour of the baozhong is hard to grasp, flirting as it does behind the thin, silken curtain of the roast. Some honey, but the roast is dominant, which is a shame. Perhaps the baozhong (always a delicate leaf) just does not have the legs to make itself shown above the thick, encrusted accumulations of the years. It marches on forever, so unlike many younger wulong, and when it does fade, it is a gentle, dignified and graceful recession, rather than the ragged ending of so many. Living up to its name, this baozhong [wrapped kind] is rather hard to unwrap. The repeated roastings have fused and dried it. The leaves are excellent: a small tip-grade, which have been hand-picked. They chose a good tea to keep for aging. The roasting is smooth, but too dominant. There is little to this tea except the smoothness of the roast, masking the subtle quality of the leaf which is only glimpsed in occasional teases in the nose, or aftertaste. Fine, but rather a one-dimensional experience. This is definitely a tea to enjoy in the wenxiangbei. 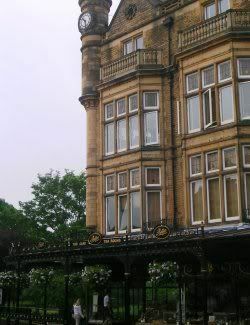 I'm in Viking country for the next five days: Harrogate, near York, in the dim and distant north of England. I'm not sure why a conference would be held here, but it's very pretty and so I won't ask. It always amuses my American colleagues when I mumble about travelling five hours to get to the other end of the country - it really must seem tiny to North Americans. Before I left, I thought it wise to dip into my sample of this tea. Marketed variously under "Yanching Hao" and "Yangching Hao" by Houde (I've used Pinyin: Yangqinghao), from whence cometh this sample, this tea claims "gushu" [ancient tree] status, and the even more nebulous "chawang" [tea king]. Comprised of maocha from the "six famous tea mountains" with an estimated 30% gushu leaves, I wonder if a claret producer would be allowed to name their wine "Margeaux" if it were less than 1/3rd proper grapes, with the other 2/3rds coming from "France". AOC/DOC enthusiasts have their eyes on the future for increased Chinese naming and quality regulations. It is pertinent to note, in the assessment of this tea, that it is priced at the Xizihao and Chen-Guanghe Tang level (i.e., very high). A previous issue of the Chinese periodical "Pu'er Teapot" featured this cake on the front cover. Quite an assortment [pictured]: some very dark, some green, some mid-brown, some silver tips, some stems, with something from all grades. The aroma is very high and sweet, and the scent rather appeals to me. From the infusion times, you might wonder if this tea is a bit weak, given that most one-year-old cakes are potent to the degree that infusion times must be kept low, often staying at 3-5s even out to the sixth infusion and beyond. First impressions begin, as ever, with the beidixiang, which is thin but sweet. It gives way to a decent, sugary lengxiang. The impression of weakness continues with the colour, which is a thin yellow, and continues with the flavour: gentle, grape-like, a touch of straw, and very little ku [bitterness]. This tea is gentle, clearly aimed at the "drink it now" crowd. This isn't a bad goal, but it does require that it is backed up with enough flavour to make it worthwhile. This cake is enjoyable, light, but ultimately forgettable. It has to be pushed on in its brewing to get any character out of it, and never becomes strong. The confusion in the blend becomes apparent in later infusions: a little mushroom appears, but fades by the sixth infusion, by which time the aroma has long since vanished. The texture of the tea is fine, but thin, which rather sums up the cake for me. As you can see, they are as random as we saw in the dry leaves, covering all types and genres. A true "jack of all trades, and master of none". It is pleasant enough, in its simple way, but woefully underpowered. To put it in engineering terms, this tea is like a vector sum, in which each component is pointed in a different direction, the net effect of which is a near-zero equilibrium. The blend includes too many different characteristics, none of which are solid enough to satisfy, excepting a generic sweetness. This is the risk of blending: a favourable present may be created, but the cracks in the blend soon show through, as the various weak components fail one by one, leaving an unfulfilling tea. It is not clear to me that appearing on the front cover of a tea magazine justifies such a high price, and promotion to the big leagues. This tea reminds me of the Chen Guanghe Tang in its contrivance to be pleasant and enjoyable, yet perhaps lacking the ability to satisfy. This currently costs $135 at Houde, which many of us originally wrote off as being far too expensive. 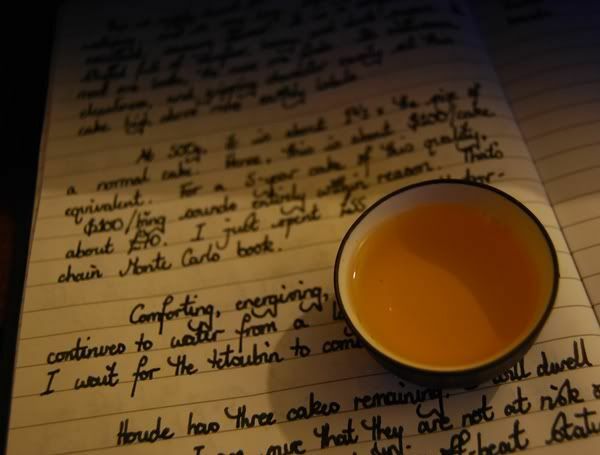 Looking over my original notes, I didn't enjoy this tea very much - I found weakness, no bitterness at all, and thought it too light to age well. Yangqinghao means "Yang [family name] celebration brand"
The leaves are beautiful, and, as the potent, pungent aroma of spring leaves fills the room upon opening the packet, I am ready to be proven wrong, and to be impressed. The sheer power of the aroma really is genuinely surprising, and the pre-dawn darkness suddenly seems a lot more welcoming. In the aroma cup, similarly, the scent is a knock-out. Heavy, dark sugars that last seemingly forever - I am already rethinking my attitude to this cake, and looking very carefully at the asking price. Gripping and mouth-watering, there seems to be plenty going on in this tea. It holds my interest very well - the more one looks, the more one finds. Heavy camphor, honey, dark sugars. Its endurance and cleanliness are remarkable, as is the resounding kuwei [good bitterness] in the throat. How I previously concluded that this cake was weak and light seems odd, in light of its obvious power. Comforting, energising, uplifting - my mouth continues to water from a long-past swallow as I wait for the tetsubin to boil a new batch of water. As the infusions wear on, the previous glories become more prosaic: it has a big, flat base of green plantation that, while never rough, does detract from the original spring-time complexities. After the third infusion, I was resolved to buy a few cakes (they are a stonking 500g); after the sixth infusion, I was down to buying just one cake; after the ninth infusion, I was uncertain whether to buy one at all. The $135 price-tag is £100 - for that money, I could buy another 1997 Henglichang "Bulang", which is about twice as good as this Yangqinghao. Therefore, I simply cannot justify spending that money on this inferior (though still very decent) cake. If this were priced around the $80, it would be more appropriate, in comparison to the rest of the (Western-oriented) tea market. Nonetheless, it's fascinating to see how two sittings, spaced four years apart, can result in very different conclusions of the same pu'ercha. In a world of mostly-dodgy cakes, where everyone seems to concentrate on single-mountain productions, it's heartening to see an unashamedly eclectic blend of maocha from multiple regions. Blending is quite a skill, and the resultant cakes can often be greater than the sum of their parts. Crikey. The world of dancong is a large one, mostly uncharted by me, but the huangzhixiang is so far off the map I wonder if I'm still in the same genre. 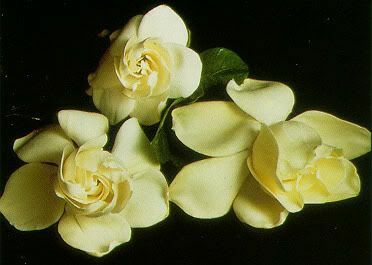 Huangzhi (or huang zhizi) is Cape Jasmine, a pretty flower native to China that we used to believe originated from the Cape of Good Hope, hence the name. Some sites (such as TeaCuppa's from which this samples comes) list this as "yellow branch/twig/sprig scent", which is translating its name literally and ignoring the fact that it is referring to a flower's scent, like most dancong. Rather like shuixian, which is named after the flower (narcissus), not the "water fairy" (after which the flower is named!). So, prior to drinking, we have in mind light, large-petalled, fairly pollenated flowers, and the usual associations of dancong. Thus armed with such expectations, the actual tea itself comes as a genuine surprise. It's a unique tea, and stands out a mile from other dancong: this is not to say it is necessarily better or worse, but... unique. Truly, this tea has fallen off the edge of the map. This is a pretty tea. The striking factor is the sheer immensity of the leaves, which are whole and twisted, and reach up to 7cm in length. Some are dark, but many are pure green. A quiet, sweet aroma of typical dancong light fruits lingers close to the leaves - which is the first and last similarity to conventional dancong. Odd infusions times, you might well think, and you would be quite right - the unstable nature of the brewing times reflects my great confusion faced with this peculiar tea, in which I experimented with all sorts of factors to see if the tea really is strange. In summary: it is. The oddness begins with the beidixiang. Primed for flowers and dancong fruits, the smooth, caramel-butter aroma was very unexpected. It was a delight, in fact. It eventually transformed into a white-sugar lengxiang, whereas most are darker, heavier, brown-sugar lengxiang. The colour is, as you can see, another oddness in a catalogue of oddities. It is pale yellow, haunted with a little green. The first impression is a pure, uncompromising astringency. Is this kudingcha? An intense, constant harmonic of astringency sings from beginning to end, which is surprising for a dancong. Around this, the flavours are sweet, floral, and high - they bring to mind large, white petals, and they linger in the aftertaste, sitting happily in the nose for many breaths. A further oddity, should any further oddity be required, is the chaqi. Now, bearing in mind I am slightly hungover on a Saturday morning, my body might be in an unrepresentative state in which to assess chaqi. I experience truly dizzying chaqi - my head swims in a manner that is nothing to do with an evening of cider and wine. My scalp prickles with heat and energy as the tea courses its way through my body. I blink, trying to determine what has happened. A little like the 60s Guangyungong, this tea feels like a tonic, or a potion. The kuding-like astringency only strengthens the impression that this is a medicinal preparation of some kind. The wenxiangbei soon quietens in subsequent infusions, but the tea does not: it is a soldier, and marches on through six infusions with admirable endurance, which one seldom sees in dancong. Huge and strong, autumnal indeed. Hefty amounts of leaf-space are oxidised. I wonder if the astringency derives from some of the pure-green large leaves, an example of which can be seen in the photograph. Like Nietzsche, I cannot abide mediocrity. I prefer extremes (in tea, at least), rather than settle for the crushing blandness of the vast majority of products on offer out there. This tea is certainly extreme, in many ways. A fascinating combination of unusual aroma, unusual flavour, unusual astringency, and unusual chaqi, this tea makes a statement. Did I enjoy this tea? I honestly cannot say. It's a baffling leaf - one of a kind. 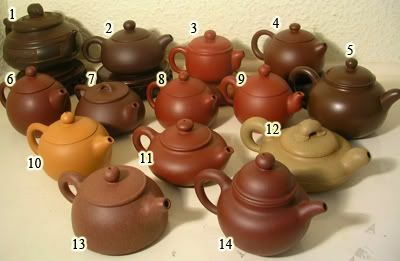 The decision to use a gaiwan was a fortunate one, as this tea surely does not match any pots. I post these mostly for your information, as the process of matching samples to names is but a subsidiary activity - however, in all fairness, there was just one taster who correctly identified each tea. Step forward... VL of Tea Logic! Bravo, sir. In the "comments" to this thread, I shall post all of the reviews that I received. 2006 Chen Guanghe Tang Yiwu "Yecha"
Also from Houde, this cake is around half the cost of its cousin, the 2006 Chawang. This tea is a blend of leaves from three regions around Yiwu: Shanhoshe, Yibi, and Dachishu, compared with the chawang's single-region Guafengzhai. As with its cousin, this yecha [wild tea] is a guhua [grain-flower, or autumnal] tea. We should expect big, robust leaves and similar flavours. What can be discerned from the state of the dry cake? The aroma is forthcoming, perhaps moreso than the chawang: sweet, mushroom-like scents fill the room. Lots of medium-size leaf fragments can be seen, with a token representation of tips. Like the other Chen Guanghe Tang (but not Mr. Chen's 2006 Changtai Trade Fair shengpu), this cake is homogeneous - there is no dressed-up outer layer, hiding poorer leaves within. I enjoy this honesty in presentation, at least. A good-looking fascia hiding something more unpleasant is a fairly dishonourable, if common, practice and puts a buyer (well, me at least) in a poor relationship with the cake before we've even started. Compare these infusion times with those of the chawang, and you can immediately deduce that this is a weaker tea. The chawang can soldier on almost without end (I certainly didn't reach a hint of its finishing after the sixth infusion), whereas this tea cannot stand up to that kind of repeat brewing. There is no question that this tea is marketed as inferior with respect to its cousin, but the difference in potency is significant. The first few infusions have some character in the wenxiangbei that rapidly fades to sweet, warm air by the third infusion. There is some character while it lasts, within those first two infusions, being a little smokey at the outset, and ending in a long, enjoyably sweet lengxiang. I like to track comparisons between what is happening in the wenxiangbei and the pinmingbei, as they can often shed light on one another. That the wenxiangbei gives up so quickly is surely a precursor to the later collapse of flavour that we see around the sixth infusion in the pinmingbei. Similarly, the smokiness from the wenxiangbei is kept in the aftertaste of the tea itself, but it is combined with a fairly decent, grain-like flavour. It lacks the depth of the chawang (which, in turn, lacks the depth of the Xingshunxiang), but it is definitely above average. There is ku in this tea, but by brewing short, it can be held at bay, appearing only as a complementary note in the finish, where it promotes a welcome salivation in its huigan. 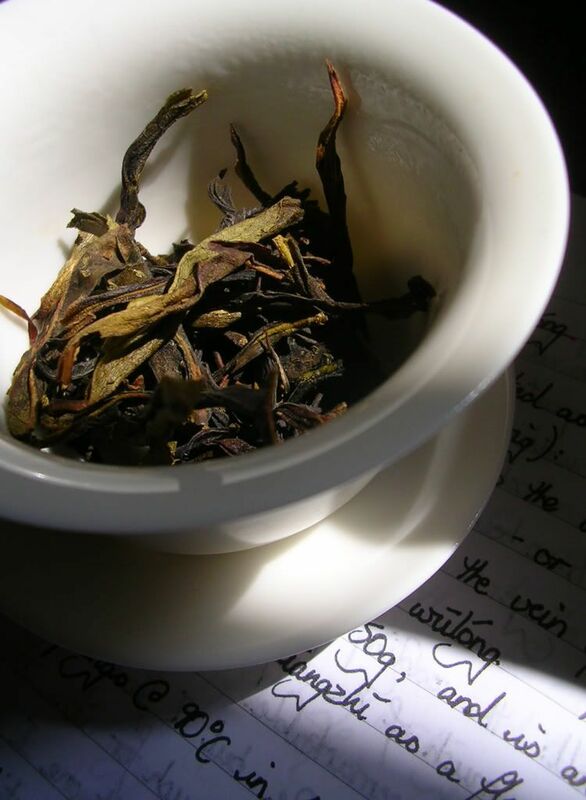 In concession to its inclusion of a few tips, the first two infusions are quite smooth, which vanishes as the lower proportion of tips gives way to the basis grades of leaves included in the blend. By the sixth or seventh infusion, a green character shows through, making the going a little rougher. The flavour, aroma, huigan and chaqi all collapse by the sixth infusion into a warm, background haze. Blended teas often lack endurance, and this is perhaps no exception. The tea is strong in caffeine. It sits behind my eyes giving a low, constant throb just like a rough coffee. There is chaqi, warming my arms and making me feel quite enervated throughout, but it is secondary to the sharp, unwelcome sensation of caffeine. This tea is very dirty. If you'll excuse the unpleasant photograph, the funnel that I use to filter the tea between pot and gongdaobei can be seen to be piled up with unpleasant sediment. These seem to be more than just fannings: the darker nodules are almost like pieces of grit, and there are plenty of them. Everything needs a good clean after this tea-session. Stronger than the thin chawang leaves, these seem to be similarly broken and chopped. As can be seen in the photograph, there are many stems containing the bottom halves of leaves. It isn't a pretty tea. This tea is actually closer in merits to justifying its price than the chawang. It isn't an exceptional tea, but it is quite decent, if short-lived. Certainly, it is above average in most aspects. It doesn't live up to the depth of flavour of the chawang, but isn't as unrealistically priced. I don't imagine myself restocking on this when the sample has gone, but it was an interesting comparison. I'd like to see Mr. Chen create a cake which uses a decent grade of leaf, but would imagine that such a "super premium" tea would likely be priced too high. The pleasures of Xizihao can be had for the same cost as these Chen Guanghe Tang bing, with better leaves and more complexity. I maintain that the promotion of Chen's cakes to the Xizihao league is based largely on his name. Let's see what he can manage in 2007; hopefully, something to better match the hype. After writing, I compared notes with VL's ever-excellent Tea Logic, in which he notes a strong bitterness, overwhelming sweetness, and little aftertaste - though I note "medium then long" infusion times. The bitterness I avoided by keeping the infusions short, and the sweetness was constant, but quite well integrated, I thought. The aftertaste, perhaps by virtue of my infusion times, seemed to deliver fairly well. One thing that did strike a chord, which I didn't transcribe from my written journal, was the presence of mushroom around the fourth infusion. I wrote, "The taste has plummeted, but become very similar to something more Menghai - combined with the constant sweetness of this cake." It is interesting that we both observed a similar transformation; "Menghai" for me is shorthand for earthy, mushroom-like tones. 2006 Cheng Guanghe Tang Yiwu "Chawang"
A big tea with a big name (literally and literately). The product of Mr. Chen Zhitong (blender of the 2006 Changtai 2nd Trade Fair shengpu), this cake is clearly trading heavily on his reputation. Do its merits justify the fascinatingly high price? This is answerable only on an individual basis, of course, and here follows mine. Excellent compression: neither too loose nor too tight. The leaves are separable without breakage observing a little care. Rather like my great-grandmother untying knotted string to relax herself, I find the process of separating a cake into its constituent leaves rather therapeutic. The aroma is rich and earthy, the leaves looking fairly whole and quite dark for a cake of such youth. Lots of leaf, using short infusions - this worked well for this energetic tea. Fairly cloudy soup, comprised of tip-fur and genuine, unwelcome sediment. On rinsing the leaf, there is a rich smell of dark fruits - black cherries, that sort of thing. The wenxiangbei is only active for the first two infusions: opening with fruity melon, becoming obvious cigarette smoke, then fading into a lengxiang of general sweetness. Not bad, not great, and the lack of endurance is notable. The soup is smooth on the lips. Immediately, this tea strikes me as "inoffensive". Not a great start, considering the price-tag that it has to live up to. 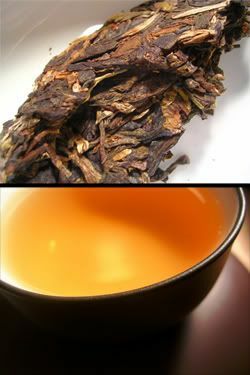 Energy is present; there is a significant ku [bitter-sour] that sits on top of a solid flavour of pure "tea". The density of flavour is unremarkable, as is its aroma and huigan. The generic "tea" flavour, a little grain-like, marches on unchanged for infusion after infusion, combined with the ever-present sweetness and ku. I keep waiting for a complexity that never appears, leaving me decidedly underwhelmed. Like its bed-fellow, the 2006 Changtai 2nd Trade Fair Shengpu, the leaves are not overly pleasant to behold: they are chopped, broken, and weak in structure. I found it hard to unroll any leaves without tearing their wet-lettuce-leaf material. For a cake to justify $80/bing unaged, it must be, without contention, a superb cake. It would be stretching the bounds of credibility to even call this cake "very good". It is a simple cake, comprising sweetness with a solid "tea" flavour that, while pleasant enough, are muted and unremarkable in their potency, patience, or ability to enthuse. The ku is strong and could bode well for aging, but I would look for more depth of flavour in a real candidate for storage, let alone a cake marketed at this price. MarshalN asked me to compare this with the Xingshunxiang bing from yesterday, recalling from memory that there were similarities. Indeed there are, in the basis of "tea" flavours combined with a little sweetness. 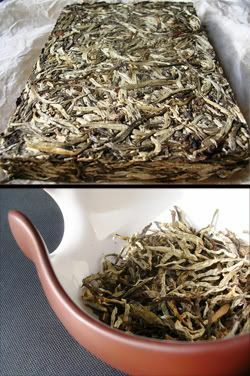 The Chen Guanghe Tang has more blatant bitterness, but seems dampened and quiet in flavour, aroma, huigan and qi compared with the Xingshunxiang. The latter was rich and enjoyable - so much so that I took the used leaves to my office the next day for further infusion. In comparison, I was rather bored by the Chen Guanghetang, which I consigned to the waste-water bowl after six infusions. The comparison is unfavourable, as for the cost of a single Chen Guanghetang, one could obtain more than a tong of the (more accomplished) Xingshunxiang. In summary, the Chen Guanghe Tang is, in my opinion, trading very much on the well-earned reputation of Mr. Chen. Remove his name from the wrapper, and this tea is surely worth but a fraction of its price, based solely on its rather limited merits. This is a phenomenon which rather blights British culture at the moment: everything has to be a "designer label". Obsessed with celebrity, my fellow countrymen prefer to purchase on name alone, and seem to have almost lost the discernment required to make value judgements on goods based on its quality alone. The Chen Guanghe Tang is not worthless, it is enjoyable in a muted way, but it is far from excellent. The cult of celebrity is extending into tea, and it requires the discerning tea enthusiast to rely, more than ever, on his own judgement in order to see through the marketing glitz. This cake is a great place to start learning. I was open to this cake living up to its name, but, being honest to myself, I cannot recommend it.